Philadephia Flyers prospect Morgan Frost (26, 27, 28, 29, 30) scored a career-high five goals, powering the Soo Greyhounds to their 30th win as they defeated the Sudbury Wolves 7-4 on the road. Frost’s five goals come one short of Paul Mancini’s 1978 franchise record as Sault Ste. Marie struck for seven goals on 26 shots. The Hounds earn their sixth straight win as Zack Trott (7) and Joe Carroll (7) joined Frost on the scoresheet while Matthew Villalta made 33 saves. Quinton Byfield (17), Darian Pilon (10), Blake Murray (18) and Jack Thompson (2) scored for Sudbury as they outshot Sault Ste. Marie 37-26 in the loss. The Hounds improve to 30-10-4-1, leading the West Division by five points over second place Saginaw. Sudbury falls eight points back of first place Niagara in the Central with a 25-16-2-1 record. Brandon Coe (10) put home the overtime winner with a quick release as the North Bay Battalion defeated visiting London 4-3. Theo Calvas and Justin Brazeau picked up assists on the OT winner while other North Bay goals came from Brad Chenier (23), Patrick Brown (2) and Matthew Struthers (21). Christian Propp made 37 saves in the win, surrendering London goals by Liam Foudy (21), Evan Bouchard (7) and William Lochead (6). London outshot North Bay 40-30, earning a single point in the overtime loss. The Battalion get back in the win column, improving to 22-21-1-2 for a third place tie with Mississauga in the Central Division. London sits first in the Midwest Division with a 30-7-5-1 record. 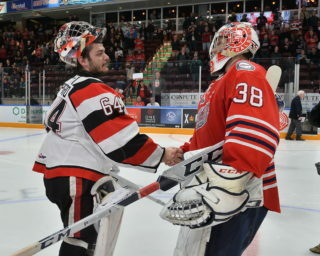 Stephen Dhillon made 49 saves, backstopping the heavily outshot Niagara IceDogs past the Guelph Storm 4-3 on the road. Goals from Akil Thomas (22, 23), Kirill Maksimov (29) and Jason Robertson (33) put the IceDogs up 4-1 before the Storm charged back to cut the lead to one in the third period. Guelph outshot Niagara 52-32 and 18-7 in the third period but Dhillon’s fine play secured the two points for his club. Thomas followed up a five-point showing with three on Sunday while Guelph goals came from Isaac Ratcliffe (33), Sean Durzi (7) and Owen Lalonde (6). Anthony Popovich made 28 saves in the loss for the Storm. Niagara’s third straight win pushes them to an eight-point cushion atop the Central Division, boasting a 27-10-7-0 record. Guelph sees a three-game winning streak snapped, falling to 24-13-4-4. Ryan Wells (3), Cole Carter (28) and Thomas Harley (8) had goals as the Mississauga Steelheads edged out the visiting Sarnia Sting 3-2. Sarnia cut the lead to one with 1:39 left in the third period but wasn’t able to come all the way back as the Trout took two points behind 27 saves from Jacob Ingham. Jacob Perreault (21) and Mitch Eliot (11) scored for Sarnia while Ethan Langevin made 25 saves. Mississauga earns a third straight win, improving to 21-19-4-1 while Sarnia drops a ninth decision in the past 10 games, falling to 19-21-5-2. Arizona Coyotes prospect Jan Jenik picked up first star honours with a pair of primary assists as the Hamilton Bulldogs took a 3-1 win in Kingston. Rookie netminder Zachary Roy stopped 23 of 24 while Hamilton goals came from Jake Gravelle (2), Matthew Strome (21) and Eric Henderson (12). 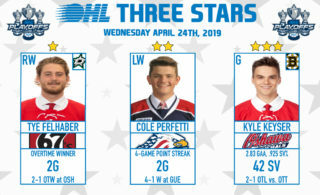 Marshall Frappier earned third star honours with a 32-save showing for the Frontenacs while Ian Derungs (8) provided their lone goal. Hamilton outshot Kingston 35-24 en route to improving to 21-21-3-1. Kingston falls for the ninth time in the past 10 games and owns a 12-32-1-0 record. 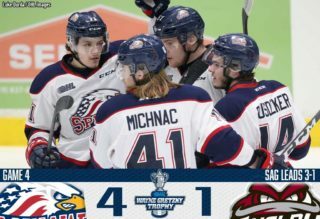 The Oshawa Generals trailed 2-1 just beyond the midway point of action but poured it on in the latter half, defeating the visiting Flint Firebirds 8-4. Anthony Salinitri’s (32, 33, 34) fourth hat-trick of the season led the way for Oshawa while Kyle MacLean (11), Brandon Saigeon (29), Brett Neumann (30), Tyler Tullio (9) and Serron Noel (25) also found the back of the net. Defenceman Nicolas Mattinen finished with three assists as the Generals outshot the Firebirds 42-27, earning their fifth straight win. Flint’s Ethan Keppen (16) extended his point streak to nine games with a goal while Kyle Harris (5), Jake Durham (31) and Eric Uba (16) also scored. Oshawa sits third in the Eastern Conference with a 28-15-2-0 record while Flint drops a third straight decision, falling to 8-36-3-0. Greg Meireles (19, 20, 21) scored his first career OHL hat-trick as the Kitchener Rangers prevailed over visiting Owen Sound 5-3. Luke Richardson stood tall in goal with a 36-save performance while Riley Damiani picked up three assists. Jonathan Yantsis (33) and Rickard Hugg (18) each had a goal and an assist, helping the Rangers improve to 20-21-3-0, two points back of sixth place Sarnia in the Western Conference. The Attack suffer a fifth straight loss as Aidan Dudas (17), Maksim Sushko (9) and Cade Robinson (4) provided their scoring. 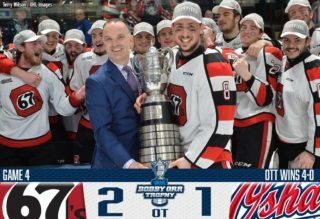 Owen Sound outshot Kitchener 39-24 as Richardson was a difference-maker. The Attack fall to 22-19-2-2. Arizona Coyotes prospect Ivan Prosvetov stopped 44 of the 45 shots he faced as the Saginaw Spirit took down visiting Windsor 4-1. Rookie forward Cole Perfetti (18) had a goal and an assist while Bode Wilde (12), Blade Jenkins (18) and DJ Busdeker (11) also tallied, guiding the Spirit to their third straight win and ninth in the last 10. Daniel D’Amico (19) opened the scoring 9:23 into the first period but that’s all the offence Windsor could muster as the Spits fell to 20-23-2-1. Colton Incze made 35 saves in the loss as the Spitfires outshot the Spirit 45-39. Saginaw sits third in the Western Conference with a 28-12-2-2 record.